Earlier this week, web censorship blog Great Fire suggested that hackers aligned with Chinese authorities were using man-in-the-middle attacks in order to harvest Apple ID information from Chinese users that visited Apple's iCloud.com website. In a newly released support document (via The Wall Street Journal), Apple has confirmed that it is aware of the "intermittent organized network attacks" on iCloud users, but says that its own servers have not been compromised. Apple is deeply committed to protecting our customers' privacy and security. We're aware of intermittent organized network attacks using insecure certificates to obtain user information, and we take this very seriously. These attacks don't compromise iCloud servers, and they don't impact iCloud sign in on iOS devices or Macs running OS X Yosemite using the Safari browser. 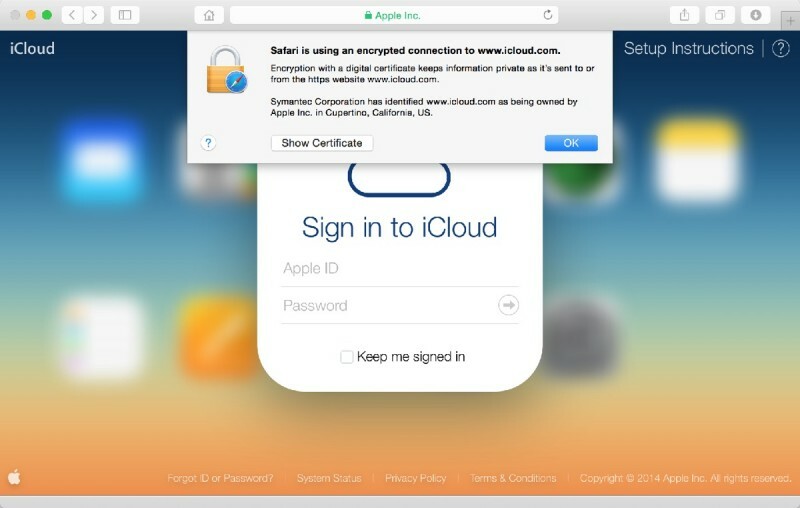 Apple's support document goes on to stress the importance of digital certificates, suggesting that users who see an invalid certificate warning in their browser while visiting iCloud.com should not proceed. The company also outlines how users can verify that their browser is connected to iCloud.com and not a third-party man-in-the-middle website. Apple asks users to make sure that a green lock icon is visible in Safari and that the message "Safari is using an encrypted connection to www.icloud.com" is displayed when the lock icon is clicked. Apple also has verification instructions for both Chrome and Firefox. Unfortunately, many of the victims falling prey to the fake iCloud sites are not using secure browsers that issue warnings when fake websites are visited. According to Great Fire, many Chinese users access the Internet through popular Chinese browser Qihoo, which does not let users know that a fake site is harvesting their information. The attack works by redirecting Chinese users attempting to access iCloud.com to a fake website that resembles the iCloud website. Users that log into the fake site provide attackers with logins and passwords that can be used to access contacts, messages, photos, and documents stored within iCloud. Though Great Fire has suggested that Chinese authorities may be involved in the attacks, a spokeswoman for China's Foreign Ministry (via CNBC) said that Beijing was "resolutely opposed" to hacking. Chinese users should switch to a trusted browser like Firefox or Chrome to avoid falling prey to the fake iCloud.com website, or use a VPN to bypass the redirection and log in directly to iCloud.com. Two-factor authentication should also be turned on as it can prevent unauthorized users from logging into an iCloud account even when a username and password are obtained. I love how half-assed Apple security is. So Apple, the "innovators" makers of "magical and revolutionary" products, can't seem to figure out internet security? My boring old bank does a great job of it, yet this is not Apple's fault? I'm fairly sure your boring old bank would fail if their direct access to the Internet was compromised. Your boring old bank is open to EXACTLY this kind of attack in EXACTLY the same ways. Furthermore, if I called your bank and asked them what to do about it they'd give the EXACT same advice Mac Rumors has given here. EDIT: And before you come back and tell me about how your bank requires a picture of a parrot or a soccer ball or something, ask yourself if you think the people who don't know what an SSL lock looks like will be at all deterred from signing in when their favorite kind of bird doesn't show up this one time. This. Someone here gets it. Two factor authentication for the win. Yes, its a little bit of an additional pain. But more than worth it. He's saying its not apples fault because this is a phishing scam. The browser goes to a scam site instead of apple's. All they can do is tell user to check for the correct certificate, reset passwords, and enable 2 factor. I don't think 2 factor would actually help. Its redirecting to a different site where they enter their user name and password. Once they have that, there are always ways to get around the second factor. I like to imagine that every nefarious hack/exploit by a foreign government or cell is actually orchestrated by Samsung.